As I think I’ve told you, I shop once a week and I buy whatever looks beautiful. Well, the shiitake mushrooms last Friday were so gorgeous, I almost cried. Really. They were so white underneath, so fresh, so beautiful. I didn’t have mushrooms on my mind, but I could not pass these up. So on Monday evening, I came home and decided to combine them with some boneless, skinless chicken breasts. I had some spaghetti squash that was begging to be eaten and some beet greens. Here’s what I threw together and it was scrumptious, if I dare say so myself! And now…a little drum roll please… watch the very first video from my kitchen! I share tips for preparing and cooking the spaghetti squash and mushrooms. Let me know what you think of it! Wash the chicken breasts, pat dry, season with salt and pepper. Heat the oil and butter on medium – medium high heat and when the butter stops sizzling, add the shallots and minced mushroom stems, lower heat to low, and cover for 8 – 10 minutes. Stir frequently during this time. Raise heat and brown chicken breasts for 4-5 minutes on each side. After 3 minutes on the second side, add mushroom caps and continue cooking, lowering and adjusting the heat. After 2 more minutes, add the vermouth and chicken broth, shake your pan to combine and sprinkle the rosemary leaves on top. Continue cooking, covered if you need to, until done, 155 degrees. Top with chopped parsley leaves before serving. Serve on a bed of spaghetti squash or with squash on the side, with some sautéed beet greens and a little savoy cabbage, sauteed in olive oil and garlic, garnished with cilantro. The countdown is here! Christmas is tomorrow. I made this fantastic side dish for dinner last night that was so rich and flavorful, definitely worthy of a holiday dinner, yet so simple. I know you’re all ready for tomorrow but the season is a week long, so try this out. It’s a new way of preparing and cooking broccoli for me. You get to enjoy the tasty stems as well, in a coin-like shape. 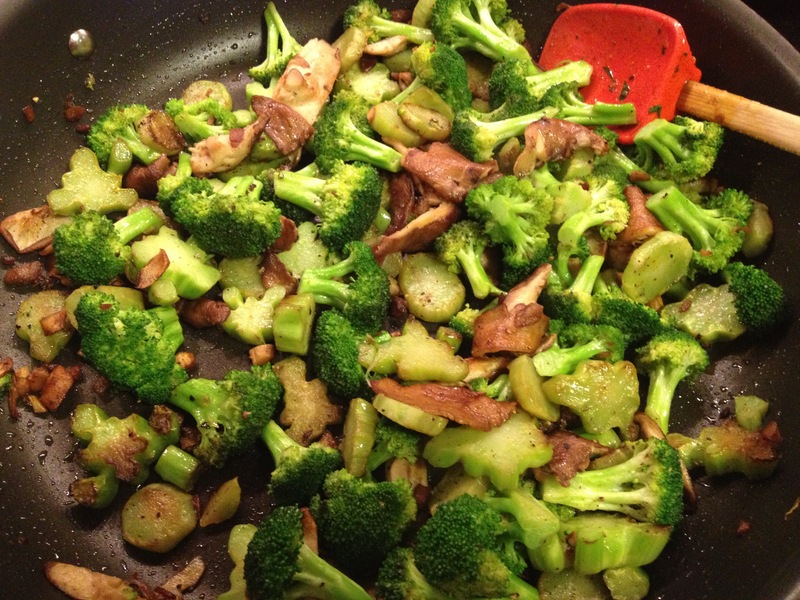 The sautéed broccoli combined with the full, rich, complex flavors of the mushrooms – it’s divine. Prepared in butter and olive oil, all you need additionally is salt, pepper and LOVE. Enjoy! Happy holidays!! Put butter and olive oil in a large skillet over high heat. The butter will sizzle. As soon as the foam begins to subside, add the broccoli and mushrooms, spreading them out evenly over the bottom of the pan and then do not touch the pan for 3 minutes. Then toss, shake, cover and cook until the vegetables are crisp tender or done to your desired liking. This should take 3 – 6 minutes more. Salt and pepper to taste. Serve immediately.